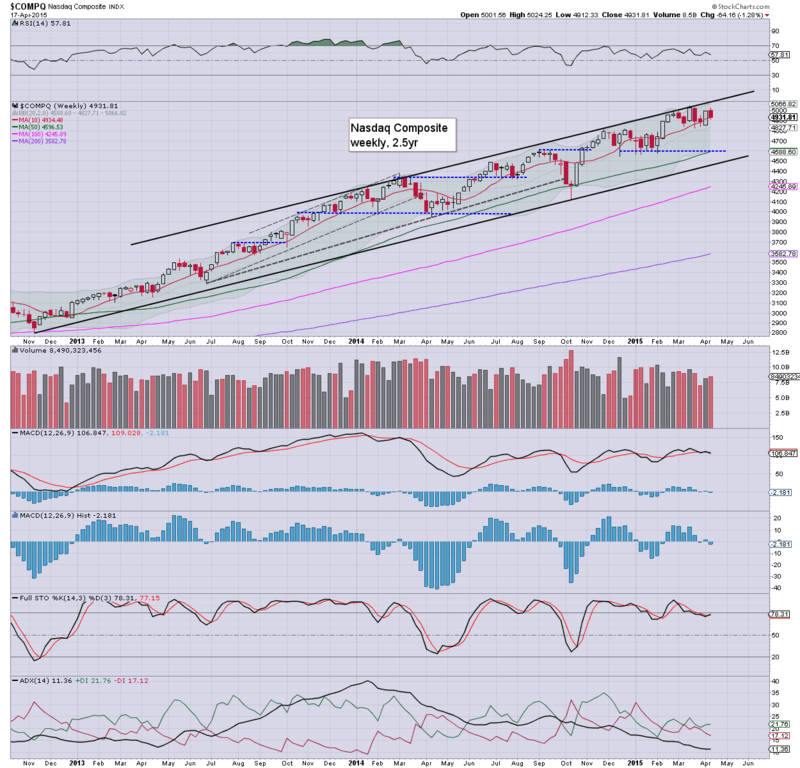 It was a week for the equity bears, with significant net weekly declines for most of the main US indexes, ranging from -1.4% (Trans), -1.0% (sp'500, R2K), to -0.5% (NYSE comp'). Near term outlook is uncertain, but with the R2K and NYSE Comp' breaking new historic highs, the broader trend remains bullish.. The sp' slipped -1.0%, having swung from 2111 to a Friday low of 2072. 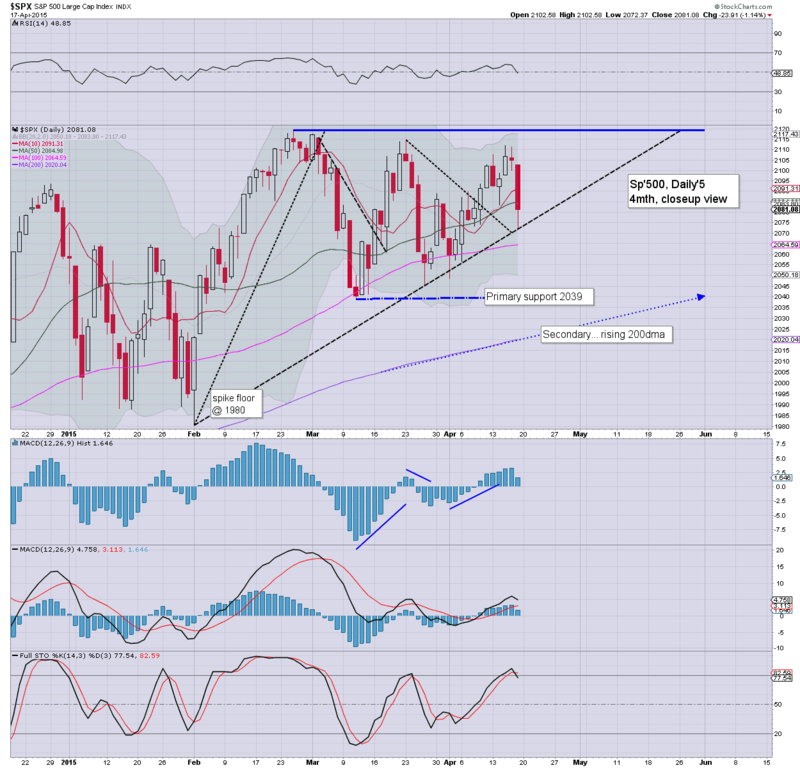 Broader trend remains bullish... unless the 2039 low is taken out. Underlying MACD (blue bar histogram) cycle ticked lower, and remained negative for a sixth week. It should concern equity bears that all this down cycle has managed to do is keep the sp' a mere 2% from making a new historic high. There is viable upside to the 2130s in the near term... and if the market can hold together into the FOMC of June 17'th, the 2170/80s will be possible. The tech saw a sig' net weekly decline of -1.3%, but like many other indexes, remains very close to recent highs. 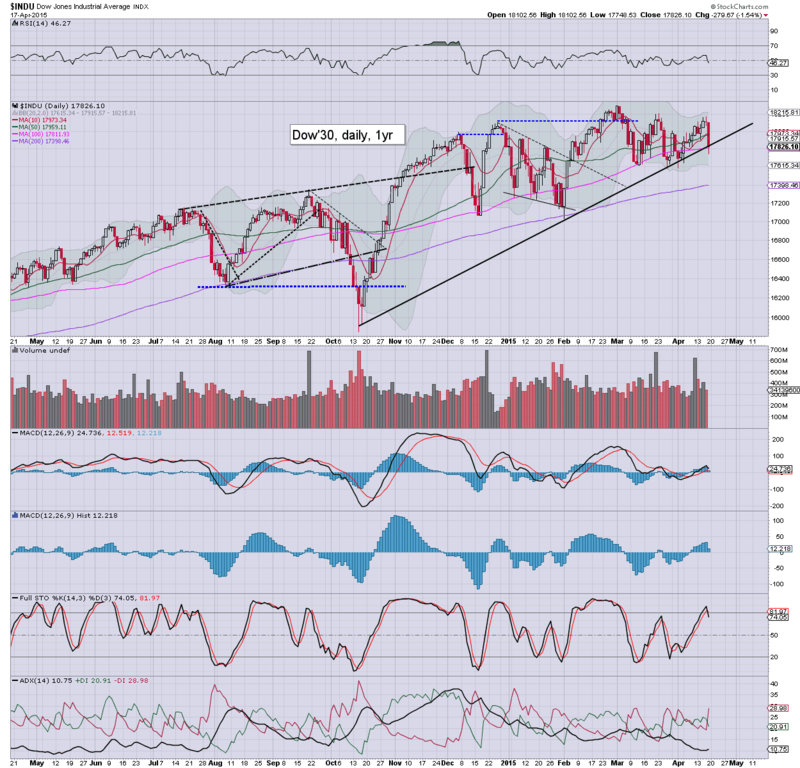 Short term support are the 4800s, with broader trend support at 4500. New historic highs... >5132 look viable in May/June. The mighty Dow also fell -1.3%, and has remained in a rather tight range for the past ten weeks. Critical rising support is now at the 17K threshold. It would seem extremely unlikely that the Dow will be <17k in the near term. 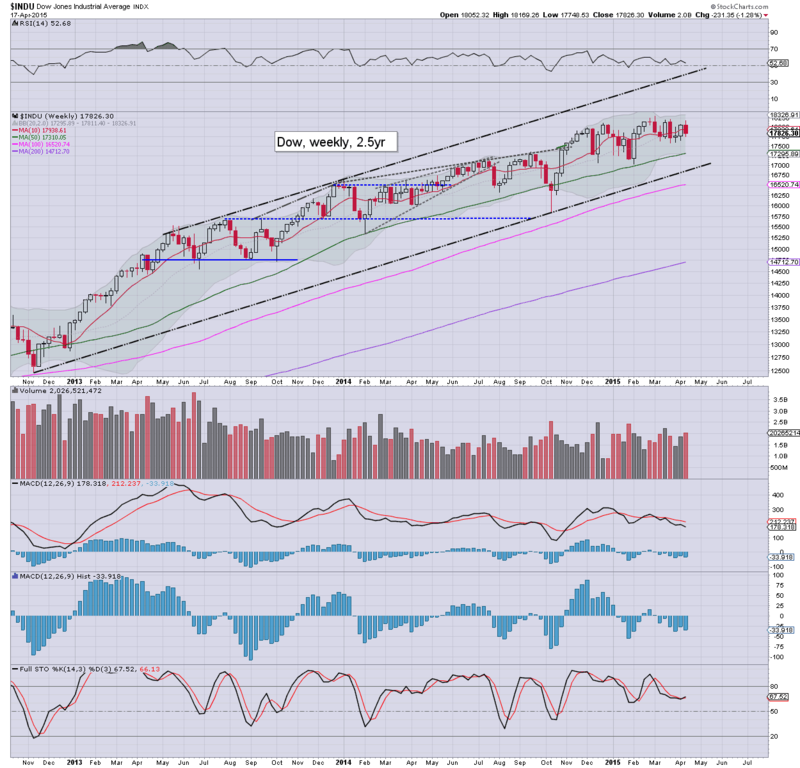 Weekly/monthly cycles are both offering the 18400s in May/June. The master index saw a moderate net weekly decline of just -0.5%. Far more notable though, the NYSE comp' broke a new historic high of 11203. Near term support is around 10900, with secondary at 10400. Underlying MACD cycle remained positive for the fifth consecutive week. There is very little bearish here. The second market leader saw a net weekly decline of -1.0%. 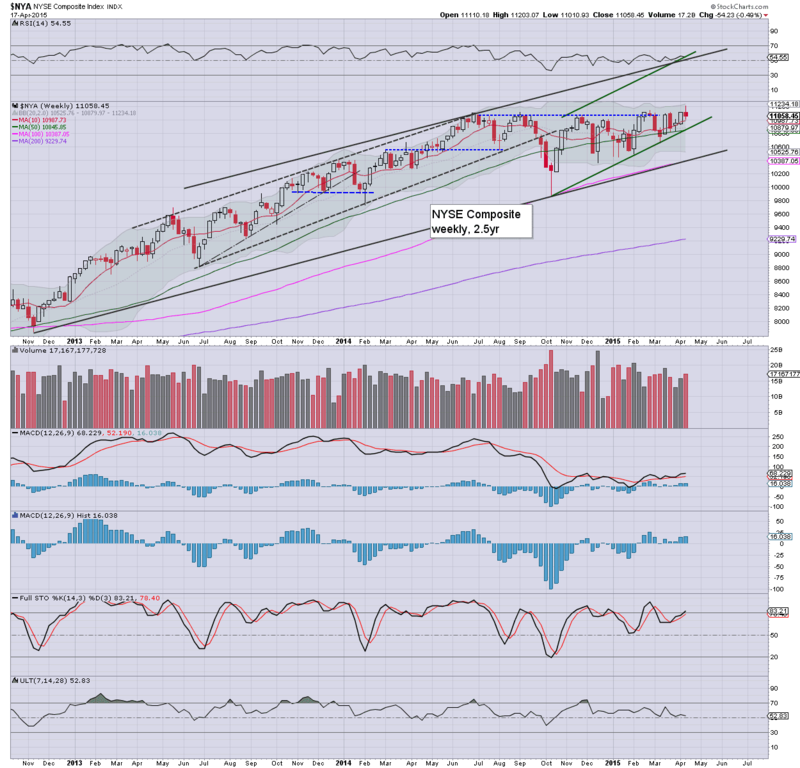 However, like the NYSE comp', it is highly notable that the R2K broke a new historic high 1278. Key support is now the 1200 threshold, and it would seem unlikely that will be lost any time soon. Underlying MACD cycle ticked lower, but has remained positive for 24 consecutive weeks.... unquestionably bullish. The 'old leader' fell a net -1.4% this week. Underlying MACD cycle ticked lower, and has now been negative cycle for 15 consecutive weeks - a stark contrast to the R2K. Critical rising support is at 8450... which links back to the low from late 2012. 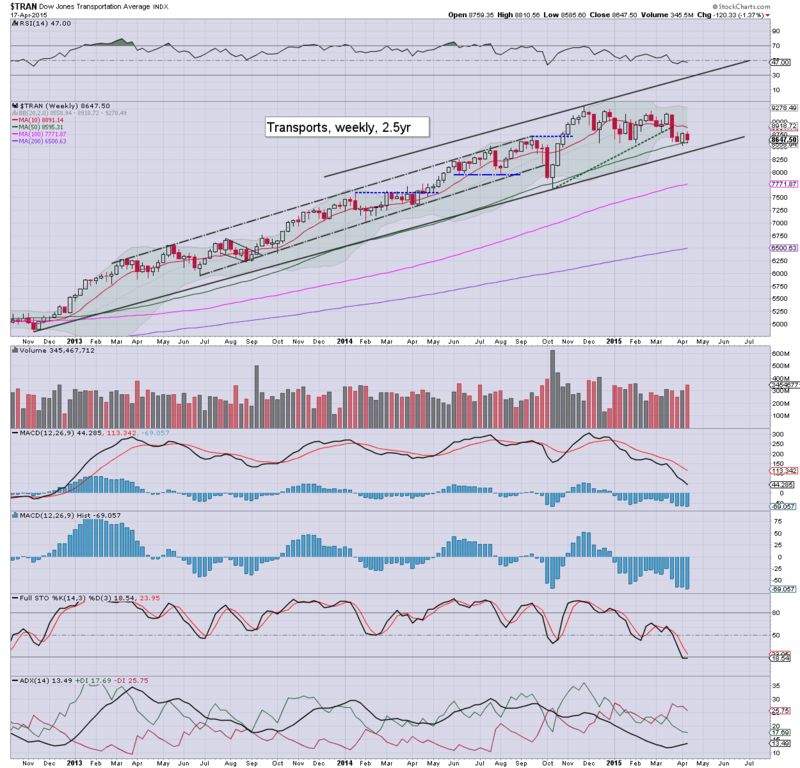 If trans loses the 8400s, it would bode for further weakness to the Oct' low of 7700... that is some 8% lower. 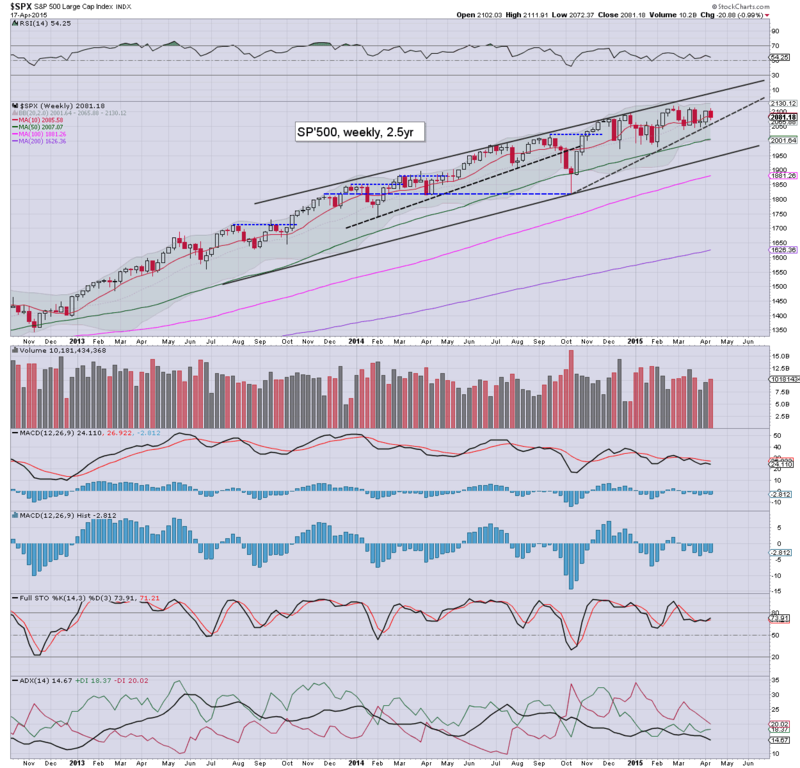 So, net weekly declines for all the main US indexes. 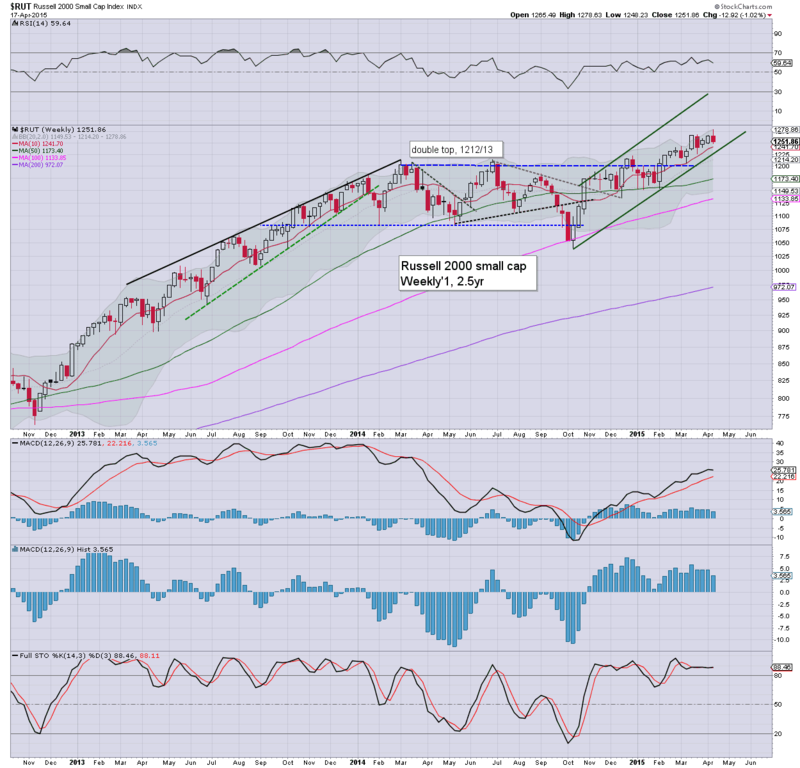 However, equity bears should be very concerned that the R2K and NYSE Comp' both made new historic highs this past week. Broadly, such bullish events are strongly suggestive against any further downside. 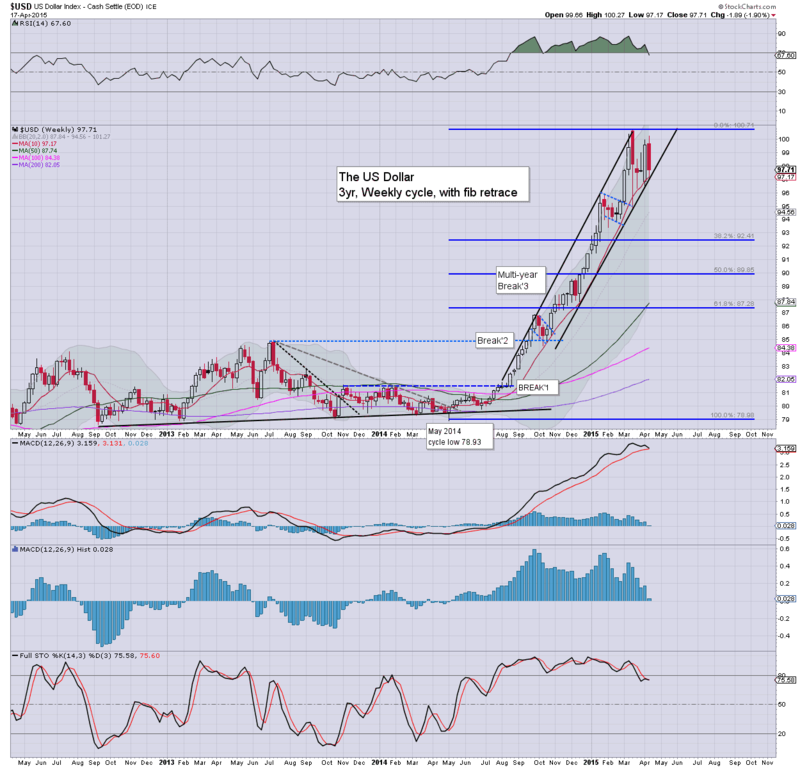 A break into the DXY 96s next week would be a clear break of rising trend/channel, and bode for the 93/92s. If that is the case, a weaker USD would be bullish for all US asset classes, not least the equity market. Further, Oil prices would surely continue rising, helping kick higher energy stocks.. and further 'inspiring' the broader equity market. 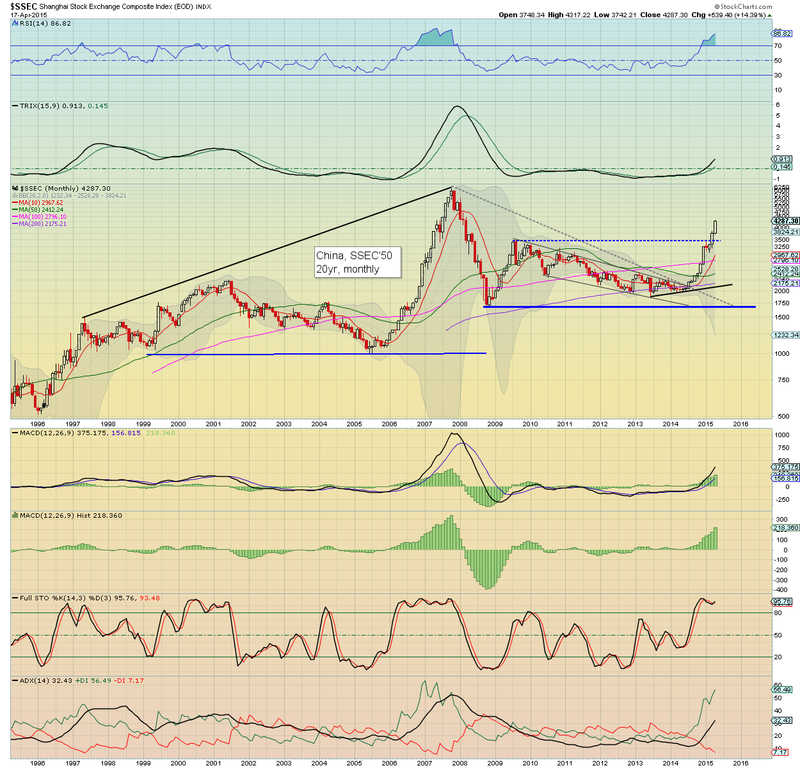 *I remain of the opinion that the USD will cool down into the early summer... flooring somewhere in the low 90s.. .before a powerful hyper-ramp to the 120s.. into year end. There is of course a truck load of corporate earnings, but in terms of scheduled econ data/events.. there is very little of significance next week. 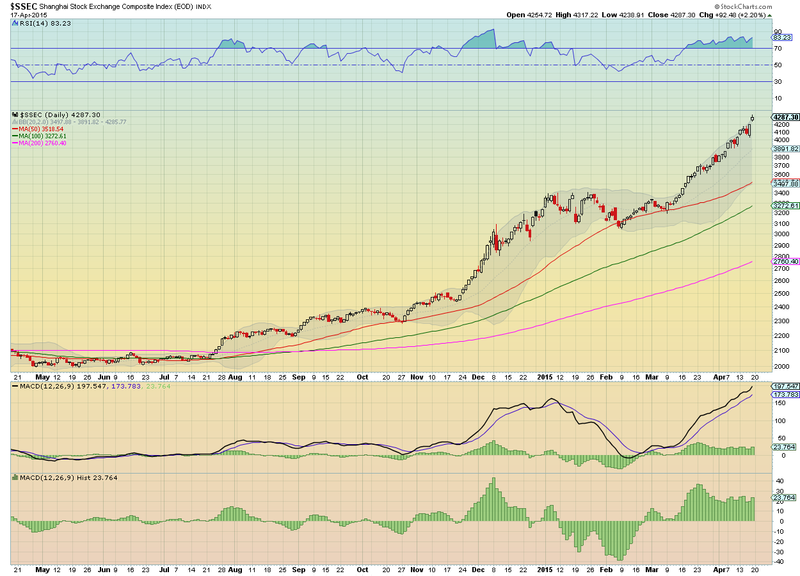 The Chinese equity market has effectively doubled up from the low of last April (1997) to the Friday high of 4317. With two market rule changes announced, China futures are offering an initial Monday morning fall of 5%. However, it is entirely ironic this only takes the market back to the level of a few days earlier. China wants to broaden/allow more stocks to be shortable. Further, it wants to stop traders using margin to buy OTC stocks. Frankly, both changes seem reasonable... but clearly, its given some traders the excuse to suggest a short term peak has now occurred. Personally, regardless of the price action early next week, I'd guess the SSEC will likely continue broadly higher to the giant 5K threshold... certainly by early Autumn. 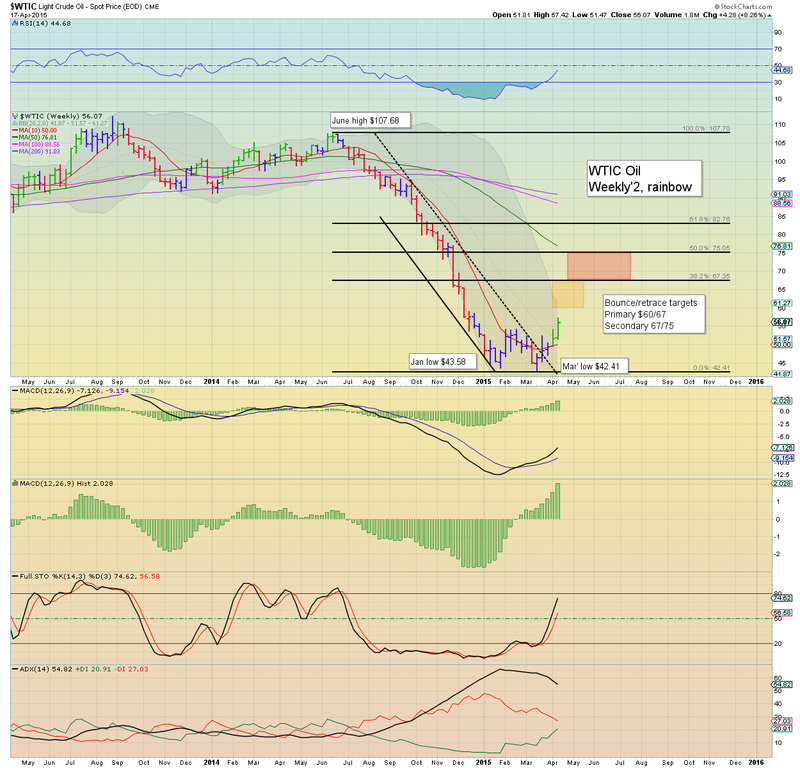 A powerful net weekly gain of 8.3%, with the second consecutive green candle. Outlook is very bullish into the summer, and I'm guessing there is a high probability Oil will claw into the $67/75 zone. US equity indexes closed significantly lower, sp -23pts @ 2081 (intra low 2072). The two leaders - Trans/R2K, settled lower by -0.7 and -1.6% respectively. Near term outlook is now very uncertain, not least with the China market set to see a major opening Monday decline of 5% or so. So.. significant net daily declines to conclude the week for all US indexes. The sp'500 arguably some support in the sp'2070s... but until its back above the 50dma (2084), equity bulls can't be quite as confident as they have recently been. Underlying MACD (blue bar histogram) cycle is set to turn negative at the Monday open, and is certainly suggestive of at least some weakness early next Monday.